Charlotte Jean Roberts was born in Glenwood, MO, on October 19, 1922 to Grace A. (Graves) Roberts and Herman W. Roberts. Her other family members were two brothers, G. Sam and R. Waldo and one sister, Mrs. Carol Halloran. Her parents and brothers predeceased her. After graduation from Lancaster High School in Missouri in 1940, Jean attended N.E. Missouri State Teachers College from 1940-1941. That year she transferred to St. Louis University, St. Louis, MO where she studied nursing and received a B.S. and R.N. in 1945. 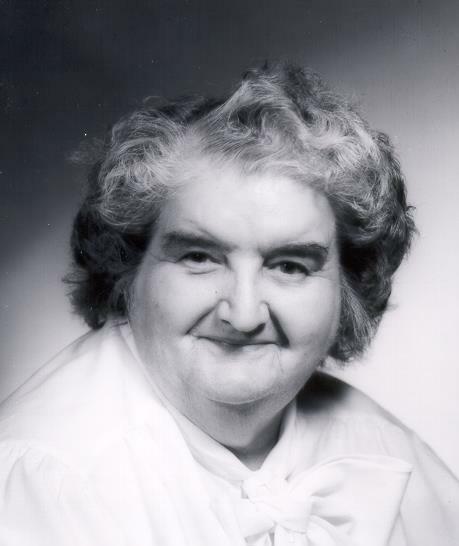 From 1945-1947 she did her time in the Army Nurse Corps, completing her term as a Second Lieutenant, then pursued work as a pediatric nurse at Children’s Hospital, also in St. Louis. In 1947, on December 11, Jean was received into the Catholic Church to the wonderment of her traditional Christian family. Around this time she became familiar with a publication, “Sisters of Maryknoll.” Meanwhile a parish priest, possibly also chaplain at the Hospital, engaged Jean in working with children, even to helping a youngster, a patient in the hospital, prepare for First Communion. This event helped solidify her aspirations towards missionary work. It seemed, that step by step, Jean was introduced into the Missionary field she had envisioned since “the age of 8”. What followed is what we know of Jean’s Maryknoll history. She applied to the Maryknoll Sisters Congregation and entered the Novitiate in Valley Park, MO on October 14, 1949. Her orientation experience was like that of most new entrants, combined with the added newness of the culture of religious life within Catholicism. With her group, she was accepted as a novice and given the name Sister David Anthony. She made her First Profession of Vows on May 8, 1952, and her Final Vows on May 8, 1958 in Kansas City, MO. This was the site of the Queen of the World Hospital, Kansas City, MO which our Congregation accepted to manage as a place from which African American physicians could enjoy a practice within the climate of civil rights. Here she became the Director of the Practical Nursing School. Experience here profoundly affected her; it met her need to contribute to justice during the years of the 1950’s in her own country. Jean’s first overseas assignment came in 1965 to the Mexico/Guatemala Region in Middle America. In preparation for a nursing education program in Jacaltenango, Guatemala, Sister had to learn Spanish and to qualify as a nurse in the Republic of Guatemala. This was accomplished in September, 1966. At the Jacaltenango Hospital she engaged in nursing education and became Director and Teacher of Practical Nursing from 1973 to 1975. Sister returned to the Maryknoll Center in 1976, and for the next five years contributed to the Congregation’s developing Health Services. She followed this with a term in Nicaragua doing pastoral work, and then made her way back to the Jacaltenango Hospital in Guatemala for administrative work and health education. Jean was to see the development of Guatemalans involved in the hospital and to witness the tragedy of civil war as it affected the people and our own Sisters. Her friendship and appreciation for Sr. Dorothy Erickson, a Maryknoll Sister Doctor, gave her a unique opportunity to record what is becoming the history of the Maryknoll Sisters in Guatemala. This long-term task, accompanied by taped verbal histories, had occupied Jean since her return to our Maryknoll Center in New York in 1999. Once Jean shared with me the anomaly of the war situation in Jacaltenango, … a Catholic hospital expected to give protective health care to the indigenous victims of the military and the expectation on the part of the military to receive equal protective care from the same source! Later Jean turned over this sizable history to Sister Bernice Kita, who presently continues the project. IN POETIC BEAUTY AND STRENGTH. In her later years health problems plagued her. Respiratory difficulties made her less mobile. Diminishing vision, however, required a good deal of compensation so that she could continue to write poetry and enlist help from others to edit it. When there were fun times, Jean produced some of the fun. She maintained long friendships, and kept much in her memory. When Regional members gathered, the Guatemala region was happy to celebrate and call up memories. Jean was among us at these times. She offered herself and her talents when she came to become a missionary. Maryknoll is grateful that God called her to us. We welcome as presider our Maryknoll brother, Edward Moore, who also served in Guatemala, knew Jean there, and maintained a long friendship with her.